Newly refurbished, our 1 Room apartment is a perfect mix of luxury and comfort. Our 1 Room apartment is a perfect mix of luxury and comfort. Newly refurbished, with a new bathroom featuring a bath and massive rain-head walk-in shower, this is our most lavish yet. There's plenty of space in the living room and bedroom. It also offers a kitchenette with dish-washer. We have added a new fresh design, yet keeping with our Jan Neruda theme of books and poetry. We nick name this apartment Sonnet. This is the perfect apartment for a romantic getaway for 2. We can also fit another 2 people on our fold-out couch bed or even turn the bedroom into a Twin room. We promise you, you won't want to leave. Located close to Charles bridge and Prague Castle on Mala Strana, Nerudova street. For this reason we have chosen the name Friday Songs. Jan Neruda, an important Czech journalist, writer and poet, whom lived on the street now named after him, wrote a popular set of poems titled 'Zpěvy páteční' (Friday Songs). Which we have used as our design inspiration. I pay special attention to customer service. So I will be there to check you in, give you a map and some helpful tips on this beautiful city. I'm also always on-call in case you need anything at all. I am an Australian living in Prague. I met my now wife in London some time ago. We moved to Prague 8 years ago and absolutely love it. It's a beautiful city! It is forever changing. There's so much to do and see. All give you a lot of great tips depending on what you want to see or do whilst you're here. 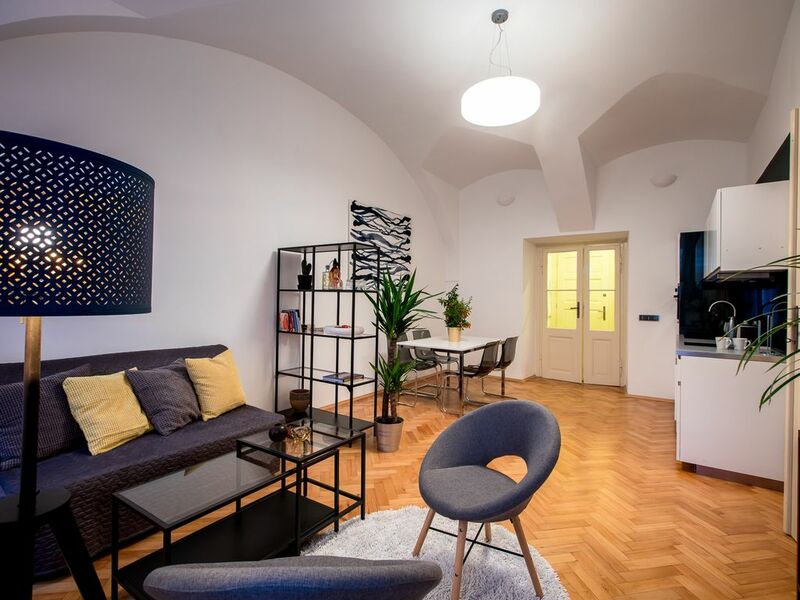 For it's perfect location - in historical Mala Strana. Plus the space of the apartment and it's great condition considering it is a historical building dating back to the 18th century. You can walk to all the main sites from the apartment. Charles bridge and Prague Castle are both only 5 minute walk away. And Old Town square 30 minutes. What I really love also is that it is really well connected with transport and it is away from all the noise of Old Town in the evenings. Meaning you can get some peac e and quiet but still find bars and clubs located not too far. There's some nice cafes nearby local bars and cafes. There's even a classic Czech Restaurant located in the building which has a really nice court yard for those warmer months. I will give you plenty of great tips. toilet, tub, shower, The bath and shower are separate. Best location and very cozy! I was delighted when I walked in the door and remarked that it looks better than the photos!! Leigh was fantastic! Met me at the door and spent as much time as I needed explaining where things were, good restaurants, sites, etc. It was my first time to Prague and traveling alone as a single woman, so it felt great to know there was someone I could contact if anything went wrong. The location of the apartment couldn't have been better for my needs and interests and two minutes from the main tram and metro stop in Malo Strana. There were many cafes and pubs to choose from in the evening and the area was extremely safe. I'll be back and I will be recommending this apartment to friends!! Thanks Leigh!! Thanks very much Bernie for the lovely review. It's great to hear! It was a pleasure hosting you and I hope to do so again soon. Loved staying in this 1st floor apartment. It was clean, decorated with nice touches and just a couple blocks to the Charles Bridge and Old Town, and a short walk the other direction to Castle Hill. Neighborhood was a welcoming contrast to Old Town with less congestion yet fun little places to eat, shop and walk. Our host Leigh was warm, welcoming and informative. Would love to stay here again and we highly recommend.